■ nasty treatment by frustrated writers. BTW, writer’s block can be alleviated through busying yourself with the acute problem of your fountain pen. Your anxiety moves momentarily into your subconscious where it will dissolve, most likely. Reduction of the ink volume alone is no problem because the capillarity of feed and nib is generally capable of holding the column of ink resting on them. Drawing ink out of the reservoir creates a slight vacuum, which is of support. It is built up gradually until the pressure difference is sufficient to rapture the meniscus at the air-inlet. The feed should compensate for variations in ink flow. The challenge arises, when the air-volume in the reservoir increases due to ambient variations, which is the case when temperature increases or air-pressure drops. Now ink is pushed out of the reservoir. Due to tuning the capillarity, the liquid-membrane at the air-inlet will withstand the pressure change, and therefore, the ink will be absorbed and stored in the capillary slits in the feed. I constructed the feed in a way that the slits also open towards the air-canal. It permits the slits to fill more readily and, just in case, some ink does escape from the air hole of the reservoir, it will be absorbed by the slits. In order to test the feed, one must understand the principles of physics and then built an environmental chamber to simulate the change of ambient conditions, independently, accurately and repeatably. This permits to research on the impact of parameters individually and in combination. In case the researcher is confronted with two (or more) variables one tries to keep one of them as constant as possible. This permits a systematic approach to solution finding. Meaning: at a constant temperature, the product of pressure and volume of one condition C1 equals the product of another pressure and volume of another condition C2. P1 × V1 = P2 ↓ × V2 ↑ … if one goes down the other has to go up in order to keep the product constant. In diagram 1 I show the above applied to fountain pen conditions. Here the volume is enclosed in a solid container (cartridge or tank). For the ambient pressure variation to have an effect on the enclosed volume the enclosure needs an opening, which also serves as an overflow. Now we have the volumes before and after the ambient pressure reduction … and the volume, which must be absorbed by the capillary slits in the feed. VFeed is not drawn proportionally! Meaning: at constant volume (when the volume is firmly enclosed), the ratio between pressure and temperature of one condition C1 equals the ratio of another pressure and temperature of another condition C2. Said in an applied way: if you have an enclosed volume of gas at a temperature T1 and a pressure P1 and you increase the temperature up to T2 then, the pressure P2 increases proportionally. Meaning: an enclosed, but expandable gas volume Vbefore changes up or down to volume Vafter proportionally with the temperature changes, which makes hot air balloons rise up into the air. ■ When the temperature of the gas volume in the reservoir increases, ink will be pushed out. This ink needs to be captured by the slits in the feed. ■ Ink gets also pushed out when the ambient pressure decreases, as it happens significantly during the ascension of an aircraft, but even barometric changes can be significant enough to this effect. This is why it is recommended to store fountain pens with the nib upwards. Whoever invented desk fountain pen holders should be cursed. They were okay for nib holders, but sometimes tradition must be discarded. When travelling in an aircraft, it is best to empty the tank or remove the cartridge. Just to be on the safe side. If you know your fountain pen well you want to take the risk: Filling it (reducing the air volume in the reservoir) before embarking can be enough to prevent leakage. 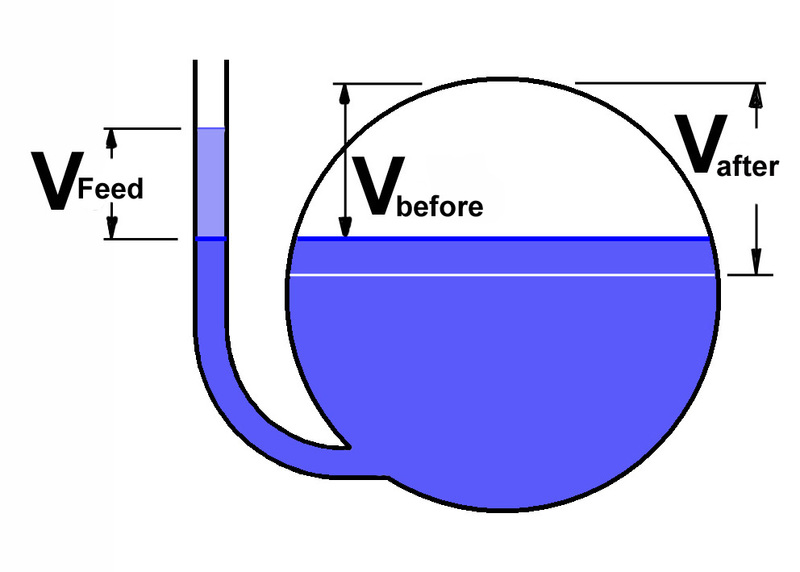 If the air volume is only small (the reservoir is almost full), the feed can cope with the amount of ink pushed out of the reservoir due to the variation of the air volume inside. Technically and practically, one should define a particular worst-case scenario, which is acceptable by consumers and with this, the feed must be able to cope. This directly determines the maximal volume of the ink reservoir a fountain pen feed can handle. There is an authority, above them. After one agrees to specific combined maximum ambient temperature and pressure variations the feed should be able to compensate, one can calculate the size of the reservoir. And vice versa: If the reservoir size is given, then one can calculate the air-volume variation a feed can compensate without spillage. This result would be the theoretically best achievable. The practically achievable is less because of manufacturing tolerances. No one wanted to agree on any of the above. Therefore, I took what was given (size of the reservoir and the outer shape of the section) and calculated the theoretically possible value of air-volume variation. This was important because it indicated how far any feed construction had been away from the optimum. It told me when to stop with my work. I had an ambient chamber to alter temperature and pressure to simulate the changes where I could test how close the function of the feed reached this target. ■ The larger the air-volume is, the larger the air-volume variation is at particular ambient changes, which pushes the ink out. ■ If one keeps the maximum air-volume variation below the absorption capacity of the feed, the fountain pen will not leak. ■ The size and form of the feed, thus its absorption capacity depends on the envelope given by the shape of a fountain pen’s grip section. Below I showed the above criteria in a linear way of dependence which applies in both directions. Unfortunately, even this is so transparent, those in charge are blind to it. The size of the reservoir is determined by competitive marketing games, organised by the same people who want to have the best product on the market. Are they open to negotiation? I am sorry to inform you that you have Boyle’s Law explanation wrong. You say — P1 × V1 = P2 ↑ × V2 ↑ … if one goes up the other has to go UP in order to keep the product constant. No – afraid not – If one goes up, the other must come DOWN to keep the product constant. Substitute a couple of values and it will become obvious. Apart from that, a heck of an insight into a wonderful piece of kit.